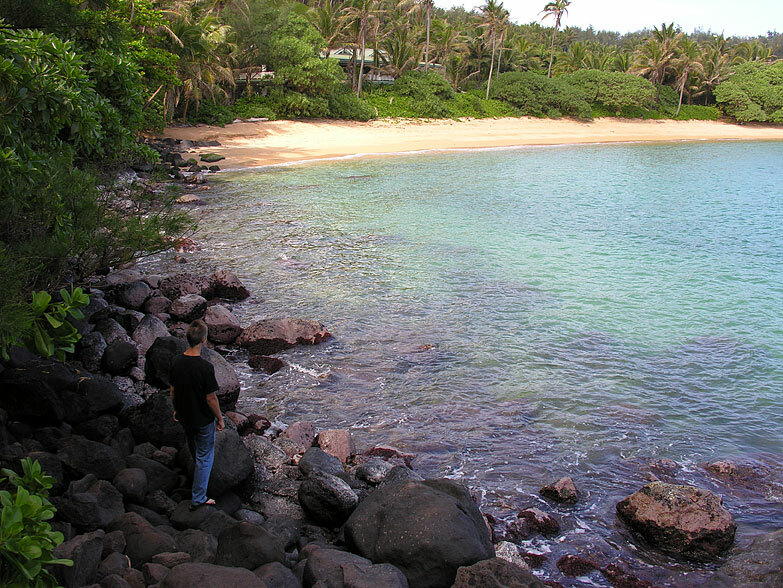 A federal court judge has ruled that the public cannot reach Papaa Bay beach on Kauai through movie producer Peter Guber's property, ending a three-year battle over access that led to at least four arrests. While there is other public access to the pristine beach with a beautiful lagoon, Kauai County had argued that it owns a road that connects Papaa Road directly to the beach. The existing path to the bay involves about 10 minutes of hiking across a relatively steep hill and about 50 yards of boulder-hopping. But the road, which twists and turns through Tara Plantation, Guber's property, leads directly to the sand. There is a gate, however, that prevents public access. The county and Mandalay Properties, Guber's management company, had sued each other, and the case ended up in federal court. Judge Kevin Chang ruled last week that Mandalay has clear title to the area and that there is no evidence that the road ever was owned by the county or the state. In granting judgment for Mandalay, Chang said the county could not prove that the road had been used by the public consistently since 1958, when the gate was built. Consistent use of the road, which did take place before the gate was built, could have created an easement, Chang said, but the statute of limitations ran out in 1978. The county did not return calls for comment. Paul Alston, Guber's lawyer, said his client was "very pleased" with the decision. While the county does have the right to appeal, Alston said, "our position has always been that there was no evidence to support the county's claim." If the county continues the appeal process, he said, he will continue to appeal another lawsuit filed to recoup expenses from the county. "It's pretty much over," he added. The controversy began in 2003, when public-access advocates found maps and deeds dating to 1931 that seemed to offer evidence that the public owned the road. 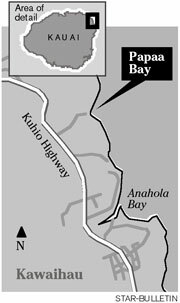 Despite calls for calm from Kauai Mayor Bryan Baptiste, the public showed up in December 2003 for a "public-access celebration." Police officers turned away more than a hundred people trying to use the road to get to the beach. Four people were arrested for trespassing. One man pleaded no contest and received a $50 fine. Charges against the three others were dropped about a year later, when the county hired a public-access expert who decided the road was public. That led to numerous lawsuits. Loke Perreira, head of the public-access committee for the Kauai Chapter of the Sierra Club, was at the 2003 celebration. She said yesterday that she had not heard about the decision, but that it was typical of Kauai, where rich landowners push around the general public without protection by elected officials. "With money, (the millionaires) can move mountains, literally," she said. "The next generation is going to lose out if our leaders don't save some of it." Tara Plantation has been for sale for a number of years. According to real estate Web sites, the six-bedroom, 8.5-bath home with numerous amenities (including a caretaker's home and ranch land) on 23.5 acres of land is offered for a little less than $30 million. The whole parcel, which includes the home and 171.3 acres, can be purchased for $46.5 million.